There is something delicious about Southern Tuscany in autumn. Maybe it’s the hibernating bear in all of us, but suddenly salad doesn’t sound so appealing. Instead, slow cooked meats and gutsy stews dominate our food fantasies. We want forest-floor flavors, rich tastes and memorable suppers to chase away the chills. For the locals, autumn is the season for hunting and gathering. It’s what they do best. As the days shorten, everyone gets a little bit cagey. The best-kept secrets involve porcini mushrooms and truffles. No one is sharing where they found that wild boar or hare, no matter how long they’ve known you. 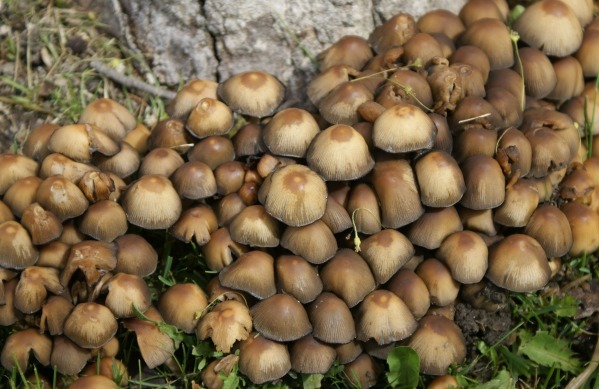 It’s a race to the forests and a time to butter up your oldest relations, those senior citizens who can no longer forage, but still remember exactly where the biggest fungatura (mushroom patch) is. The caviar of forest is so synonymous with big spending that even the priciest restaurants only give you a few measly shavings on your risotto. It’s a lot of fuss for fungus, but that hasn’t stopped Oprah Winfrey from adding truffle hunting to her bucket list. In Castell’Azzara, it’s a family business. Sitting at the feet of Amiata Mountain, the village is known as the Città del Tartufo, but if it’s locals are making millions, they’re keeping them well hidden. 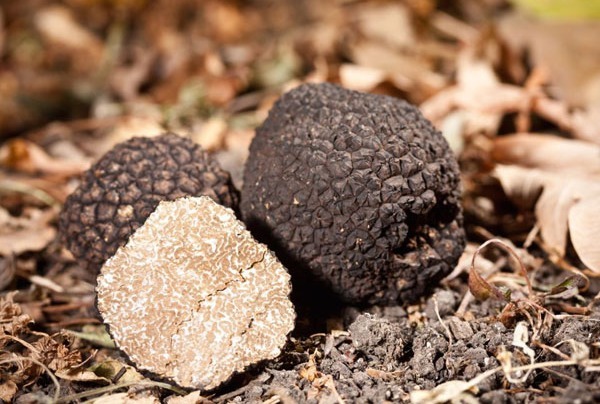 You can find truffles in the surrounding forests 11 months out of the year. The season for white truffles has just ended and now local restaurants like La Tana del’Orso will be serving the black varieties. For the locals, the fun is in the hunt and most of the truffles they find are either shared among family or given to friends. If you’re lucky enough to find truffles for sale either in Tuscany or abroad, it’s important to check when they were found. Truffle oils or truffles in jars keep, but fresh truffles become dry and flavorless in an instant. You don’t want anything that’s more than a month or two old, or it’ll be like grating air over your pasta, you won’t taste a thing. The slightly less esteemed cousin of the truffle is in many ways more delicious and far more accessible. It packs a flavor punch that truffles lack, especially if you can find it fresh. And if you happen to be anywhere near a Southern Tuscan forest this autumn, you shouldn’t have too much trouble. Porcini grow in clusters at the base of oak trees. In the forests of Fiora Valley, near the famous Saturnia hot springs, it’s a fight to see who can collect the most, with the savviest locals carting off 20-30kg in a morning alone. Porcini mushrooms are brown on top and cream underneath with a thick stem, but unless you’re a mushroom master, it’s always a good idea to get yours checked by an expert. Any tourist office can direct you to one. Otherwise you can pick up funghi nostrani (local mushrooms) from produce trucks in towns all over Southern Tuscany or try them in unctuous risottos and deep fried starters at local restaurants. 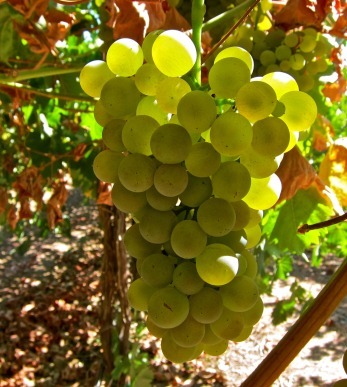 Vendemmia is synonymous with September in Southern Tuscany. But there are some vineyards that aren’t harvesting plump, beautiful grapes this season. Instead they’re taking advantage of the morning fog, occasional rain and sunny days to leave their grapes at the mercy of what’s called noble rot. The end result is not a mushy, moldy mess, but a deliciously sweet tipple known as botrytised wine or muffato. Rare and expensive, muffati are best served extravagantly with foie gras, well-aged cheeses and chocolate drowned desserts. On the coast of the Argentario Sea, just outside of Orbetello, Azienda Bruni is one of the few Tuscan vineyards to produce this lavish wine. The color of honey, it’s made entirely from Vermentino grapes and will set you back €45 a bottle. The last of our luxuriously Tuscan products might turn you stomach half as much as moldy grapes, but one bite and you’ll be hooked. It’s lardo. 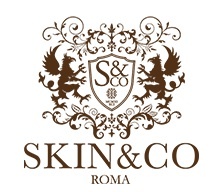 Thick strips of pork fatback cured with rosemary, juniper berries, pepper and cloves. It’s produced all over Tuscany, but there is one place that has been making it every autumn since the Roman Empire, and that’s Colonnata. Much like Castell’Azzara, this small community in the mountains of Massa is humble and quiet. 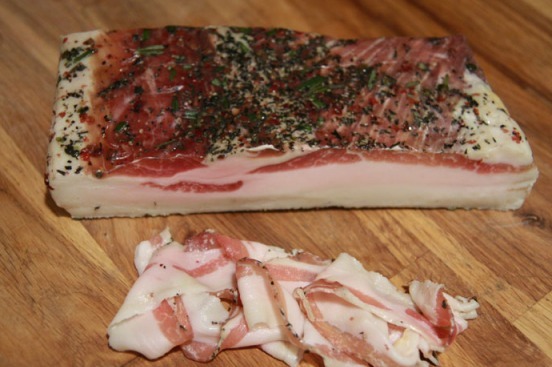 Living in the shadow of prosciutto and pancetta, lardo has always been something of a local delicacy. The huge slabs of fat are cured in marble basins from the nearby Carrara mines and served at family gatherings finely sliced and melted over toasted bread in what is simply the most delicious bruschetta you will ever eat. This salumi won’t cost you the earth, but its flavor will take you to heaven and back.